Home / Balsamic Titbits / Balsamic Vinegar: the most unusual pairings! Balsamic Vinegar: the most unusual pairings! Original Balsamic Vinegar of Modena is becoming more and more the protagonist of unusual pairings; but with regard to Balsamic glaze, which is used in an increasing variety of dishes, food experts have divergent views. MODENA. “My grandfather used to put balsamic vinegar on snow ” tells us Alessandro, born in Milan and living in Modena, while observing skeptically a dish made of snow stuffed in a cup and seasoned with sugar and lemon. In Modena even snow tastes good if drizzled with original Balsamic Vinegar. Bizarre? Not so much. In fact, if it is true that snow is not a gourmet food, it is equally true that, among the most unusual pairings, the combination Balsamic Vinegar + fluffy snowflakes is not so weird. If you open the website of Modena’s Balsamic Vinegar Protection Consortium, temple of tradition, you will find the recipe of sushi donuts drizzled with Modena balsamic IGP. A fun and colorful dish with vegetarian sushi whose preparation includes rice, carrots, avocados, radishes and poppy seeds; its shape reminds us of the classic donuts made in the USA; its author, the food blogger Monica Bergomi, defines it as “a light and satisfying alternative to include in our daily diet”. After all, combining Balsamic Vinegar and vegetables is an ever-green. The two-Michelin chef Oliver Glowig knows it very well. After his success in Germany, he moved to Italy, and became ambassador of the local cuisine in its homeland and abroad. He believes in the “greatness of Italian cuisine enhanced and reinterpreted with respect and wisdom, and finally enriched by a touch of creativity; Balsamic Vinegar is an entirely Italian ingredient, fundamental when it comes to invent surprising and unusual pairings”. So much has been said and written on the dark nectar made in Modena. It is the culinary visit card of the territory. And it is an excellence that, willy-nilly, requires a quick review. Intended for a niche consumption, the traditional DOP Balsamic Vinegar consists of grape must that must age for at least 12 years. Its production is based on the pouring system (travasi): the withdrawal of the finished product from the smaller barrel, the addition (rincalzo) of the same with the liquid contained in the barrel immediately upstream and finally the addition from the biggest barrel with cooked and fermented must. 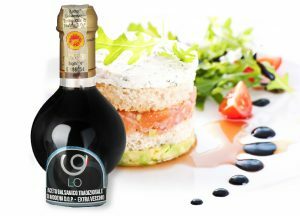 The balsamic vinegar of Modena IGP is the combination of grape must and wine vinegar. Its tradition is very ancient: when the traditional Balsamic Vinegar was running out, in order to make it last longer, people use to mix it with a fair dose of strong vinegar. Another unusual combination consists in adding Balsamic Vinegar to Karcadè infusions with lemon and ginger: pretty untraditional! However, balsamic Tradition is very strict and gives little chance to experimentation. That’s why food experts firmly believe that, not only unusual pairings, but even balsamic glaze is an insult to tradition. Today we find Balsamic glaze almost everywhere: on appetizers, on first courses, on main courses and even on desserts; this dressing is used by many chefs but still it is heavily criticized by the majority of food critics. But which is the strangest way to use Balsamic Vinegar? Definitely turning it into a sculpture. The artist Lorenzo Lunati already did it: Nadia Ugolini and Alessandro Zomparelli asked him to pay homage to Balsamic Vinegar and the outcome is a sculpture with the form of a drop at the gates of Spilamberto. In any case, if you want to deepen your knowledge about Balsamic Vinegar we report you the event Scopri e gusta!, a series of interesting appointments which started just a few days ago. The first meeting took place on Saturday, March 31 at La vecchia dispensa di Castelvetro: the guests had the chance to spend an alternative afternoon in the hills. After having visited the ancient Vinegar cellar, they could attend a cooking workshop to learn how to make Balsamic pearls. Check our website if you do not want to miss the next appointments! Balsamic sauce: Here our guide for preparing a perfect one.